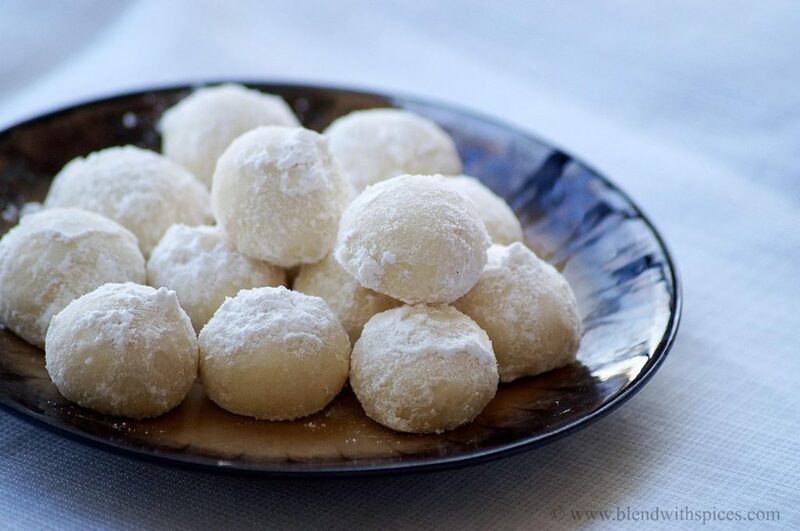 If you are looking for more Cookies Recipes then do check Coconut Cookies, Wheat Cashew Cookies, Ragi Cookies, Bajra Cookies, Jowar Chocolate Cookies, Tutti Frutti Cookies and Saffron Cookies. In a bowl, whisk together the corn flour, maida and salt. Keep it aside. 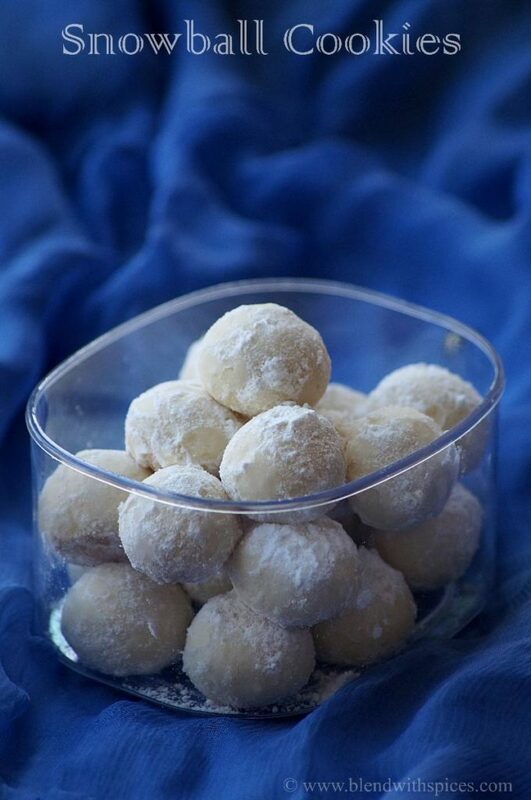 In a mixing bowl, beat the butter and powdered sugar until creamy and smooth. Add the vanilla essence and combine well. Then add the flour mixture to the butter mixture. Cover and refrigerate the dough for an hour or until it becomes firm. Roll the dough into 1 inch small balls and place them on a greased baking tray. Bake the cookies in a preheated oven for 12 – 15 minutes at 180 degree C.
Remove from oven and place them on a wire rack to cool for about 3 – 5 minutes. 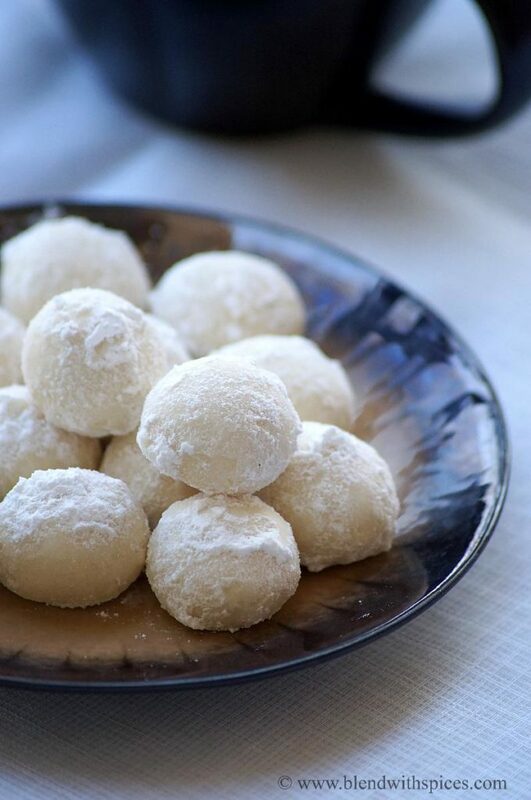 While cookies are still warm, roll them in powdered sugar. Transfer them to a wire rack and let them cool completely. If you want, sprinkle the top of the cookies with more powdered sugar before serving. Nice recipe dear..mouth watering here! lovely treat and looks awesome..
Wow,must try soon.so tempting.loved the second click! Awesome! looks awesome n wonderful clicks! They look fabulous, so delicate and melt-in -your mouth! these look perfect Hari Chandana. wish could grab a few. have a great xmas. Awesome clicks and looks delicious. I rolled mine in cinnamon sugar before they baked, they were amazing!